Betty and Archie look sweet under the blue lighting. Is it just acting or could sparks be flying on stage? Riverdale Season 2 Episode 18: "Chapter Thirty-One: A Night to Remember"
Kevin: I have a dark confession to make. After Cheryl’s brush with death this morning, I found a letter in my locker from someone alleging to be, and I can’t believe I’m about to say this, The Black Hood. It’s bad, just look. Kevin: Why would The Black Hood, who was shot dead by my dad, be demanding the role of Carrie be recast? 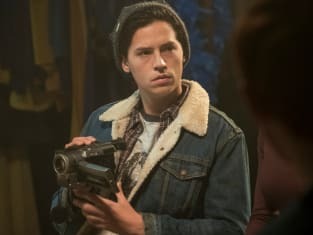 Jughead: Yeah, it does seem pretty small potatoes for The Black Hood. Kevin: Still, Jug, you can’t tell anyone about it. As the official documentarian, you’re sworn to secrecy. Also, the show, as they say, must go on. Permalink: I have a dark confession to make. Kevin: Okay, Veronica, I’m obsessed with everything that just happened. Veronica: Thank you! It helps to be off-book and in full costume. Betty: Don’t be so modest, you are the literally embodiment of Chris. Never has a role been perfectly typecast. Veronica: What was that, Betty? Betty: I mean think about it: Spoiled rich girl, check. Major daddy issues, check. Bad to the bone, trying to control everyone around her, including her boyfriend and best friend. Check, check, check. Permalink: Spoiled rich girl, check. Major daddy issues, check.